When a beautiful young woman, thought to be recently widowed, suddenly moves into the half ruined Wildfell Hall with her five year old son, young squire Gilbert Markham and the local residents are intrigued. Gilbert meets the aloof newcomer Helen Graham by chance, falls in love with her, and she with him. Their passion is held in check by her mysterious relationship with the handsome but cruel Arthur Huntingdon. Her dramatic flight from him is revealed in her journal - a story within a story. 1. A MYSTERIOUS STRANGER. Wildfell Hall, long unoccupied, now has tenants - a beautiful young artist and her child. Mrs. Markham, a neighbour, and her daughter Helen Graham, the new arrival, but are snubbed. In church, Gilbert Markham decides that he prefers Helen at a distance. Soon after, he rescues Arthur, her small son, from a tree. Helen appears hostile, but a month later Gilbert visits her socially. In Helen's studio he examines her painting while she is out of the room. He turns over one which is facing the wall and admires the portrait of a handsome man. 2. LOVE'S CROSSED PURPOSES. As the months pass, Gilbert and Helen become ever closer friends. He is upset, however, by the scandalous gossip which is beginning to circulate about her, the result of her reticence about herself. One evening, he offers to defend her reputation and proposes marriage, but she refuses him. She hints at secrets to be told and warns him that her formal life may shock him. A meeting at the moor is arranged when Helen will divulge her past to Gilbert. He leaves, ecstatic that she loves him, but turning back for one last look, overhears her talking intimately to Frederick Lawrence, the owner of the hall. Furious, Gilbert refuses to see Helen. 3. A YOUNG GIRL'S STORY. Gilbert reads in her diary that as a young girl Helen was brought up by her aristocratic relatives. In London her uncle's rich and odious acquaintances makes unwelcome advances and this upsets her. One evening, however, she meets debonair and handsome Arthur Huntington, and soon he is courting her. Helen falls in love with him, but he makes her miserable by teasing her and seeming to prefer the pretty coquette Annabelle Wilmot. Finally, having reduced Helen to tears, he proposes. 4. MISERY. Helen's uncle consents to marriage because Arthur is rich, but her aunt has reservations. Helen becomes Mrs. Huntingdon of Grassdale manor, but is quickly disappointed in her marriage. Arthur lacks her intellectual interests and is miserable when he cannot hunt. He treats her in cavalier way and shocks her with stories of his former affairs. Two months into their marriage, a joint visit to London proves joyless. Arthur becomes dissipated and asks Helen to return to Grassdale Manor without him. Only her baby son gives Helen any pleasure. 5. BETRAYED. Arthur continues to be absent from home for much of the time. When he does return, he is restless and drinks. He expects Helen to be at his beck and call, and even refuses to let her attend her father's funeral. Arthur invites a party of his drinking cronies to the Manor. With them come Lord Lowborough and his new wife Annabelle, nee Wilmot. Oddly, Arthur drinks less while his guest are staying. Pleased at this, Helen overhears one of them apparently talking about her hold on Arthur. Out in the garden at dusk, she happily surprises her husband with an embrace. He grasps her, first in passion then in strange horror. Next day, she sees Arthur and Annabelle clasped together on the shrubbery. Appalled at such betrayal, Helen confronts Arthur. He bluntly refuses her request for a divorce and she swears henceforth to be his wife only in name. 6. ESCAPE AND RETURN. Helen's diary ends with an account of her escape to Wildfell Hall, a sanctuary provided by Frederick Lawrence, her brother. Gilbert then revisits Helen but is desolated by her announcement that they must never meet again, for she remains a married woman. 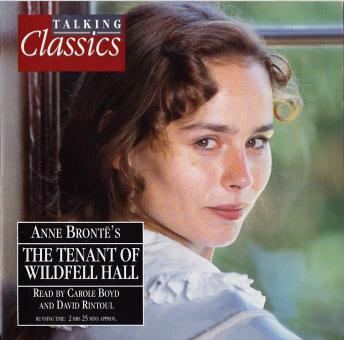 Later, he discovers that she has left Wildfell Hall. He calls on Frederick for an explanation and is told that Helen has returned to nurse Arthur, who has been seriously injured in a riding accident. Frederick then gives Gilbert a letter he has received from his sister. 7. DEATH AT RAKE. Helen's note relates that far from being glad to see her, Arthur at first takes her for an evil phantom. He mocks her Christian faith, while at the same time voicing his fear of death and damnation. His misery rouses her pity, but he is too lost in terror to heed her attempts at spiritual comfort. A second letter tells of Arthur's bitter death. 8. HAPPY ENDINGS. Before Helen returns to Wildfell Hall, her uncle dies, bequeathing her Staningley, his estate. While there Helen collapses from exhaustion. Gilbert sets out to visit her. As the coach approaches the estate, he learns from a passenger the extent of Helen's new wealth. He is embarrassed by his relativity modest affluence, and is hesitating at the gates of the estate when a carriage sweeps past. In it are little Arthur and Helen, who invite him to the house. Love overcomes his reticence, but this time it is Helen who proposes to Gilbert. Soon afterwards, they are married.